Playtime activities for toddlers are surely best when they are fun and simple. Without the pressure of complex instructions to follow toddlers can learn in a natural and enjoyable way. In this post, I share five of my favorite easy playtime activities, all of which can give your little one an amazing language workout. Long before babies and young toddlers are ready for dramatic play; puppets grab their attention. One of the best ways to use a puppet to help your child learn new words is to perform simple actions and teach verbs, like wave, eat, drink, kiss, dance, hug, sneeze, cough, sleep and so on. Most first-words learners start to use verbs a little later than nouns (names for things). Play is the perfect time to introduce them. 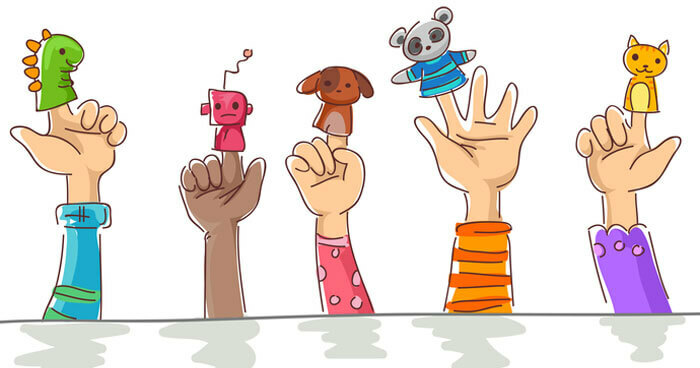 Listen out for your child’s ideas during puppet play. For example, they may like to bring objects for the puppet to eat, or show it a favorite toy. Older toddlers could tell the puppet about a recent event. Hide and seek is a perfect language game because it’s fun, interactive and very simple. You can play anytime with no preparation or cleanup, and it works with more than one child. Toddlers are often not great at hiding or staying hidden, so hide and seek can be more like elaborate peekaboo, but no matter! Keep your part in the play light-hearted and predictable. Tell your toddler to hide, and that you’ll look for them. Cover your eyes and count to ten very clearly, then say ‘Ready or not, here I come!’ Open your eyes, and ask aloud ‘Where’s [child’s name]?’ If they manage to stay quiet, you can start looking in the wrong places: ‘Is she in the cupboard? No. Where’s [child’s name]? Is she in the corridor? No. Where’s [child’s name]? Is she behind the sofa? No. Ah, there you are! I found you! You’re beside the playpen.’ Next, swap roles. Have you read your child’s favorite story so many times you know the words? Try acting it out for them, with a lot of energy and eye contact. Encourage your little one to join in. Grab some props if it helps, e.g. a toy bear for We’re Going on a Bear Hunt. Just stepping outside gives so many opportunities for talking and learning, plus toddlers love to play in the fresh air. While you’re out, hunt for nature. Look for bugs, plants, and stones to show your child down on the ground, or clouds, birds and planes to show them in the sky. You could turn this activity into a scavenger hunt by drawing images of four or five things on paper. Tick each item off as your toddler finds them. Ideas for things to spot include a leaf, a stick, a bug, a cat and a flower. Give your little one a chance to run and race, or dig about in nature. Mine enjoy making big piles of leaves and stones and describing what they find. In the backyard, their imaginations take them on wild adventures, as stripy stones become tigers, and white stones become polar bears. Your child learns: names for objects, descriptive words, storytelling skills, and early literacy skills (image recognition during the scavenger hunt). 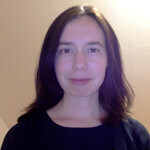 Kathleen is a writer and stay-at-home mom with two little boys, aged 2 and 3. Formerly, she was an academic, and researched and taught English language. Now she shares ideas for helping children to start to talk and develop strong communication skills on her blog, Word Boosting.